My heart is full—and I’m flying high these days with the many amazing things happening for our Babies. I’d love to promise brevity in this report, but that would be a promise I don’t intend to keep. • I had reason to go looking for a specific picture recently. The search led me to my very first “oh happy day” email. At the end of it I had written this: I’d be short-sighted if I didn’t let you know I’m in this for the long haul and will collect diapers and formula as long as God allows. • Well I was pretty much useless the rest of the day. Back then I had sure hoped this would be a long-term project, but I didn’t really know what God had in mind. I only knew that he had asked, and that my heart was all in. And if there’s one lesson I’ve learned over the last nine years, it’s that God provides. • Actually, the lesson is that God provides abundantly. • Last fall, we had another successful Dorothy’s Match campaign run by my loving parents and funded by some of you incredibly generous people. Want to see just how crazy successful? https://mauriandsherry.com/2015/12/04/dorothys-match/ Months later, I still read the blog post, shake my head in amazement, and grin from ear to ear. • One of those vital Colorado supporters is a 10-year-old boy named Chase. For the third year in a row he asked his parents for diapers and formula instead of Christmas gifts. (Seriously. If that doesn’t encourage us, I’m not sure anything will.) 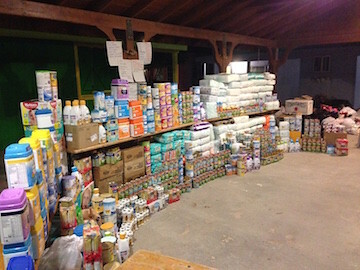 This family blessed the ministry with $1,000 to do just that. You see what I mean about God’s provision? In this messy world we live in, God is looking after his own—and he’s doing it through the heart of a young man in the suburbs of Colorado. Thank you, Chase! This means more to me than you’ll ever know. • For those who’ve been down to the colonias, you know it’s a hard life. Here are a few dear faces who also want to thank you for the help. You are making life a reality for some babies and life dramatically better for others. Isn’t this relationship we have with them the coolest picture of the body of Christ? God wants us to carry each other’s burdens. And you all get an A+. • And here’s load number 55. She went down with us in March. 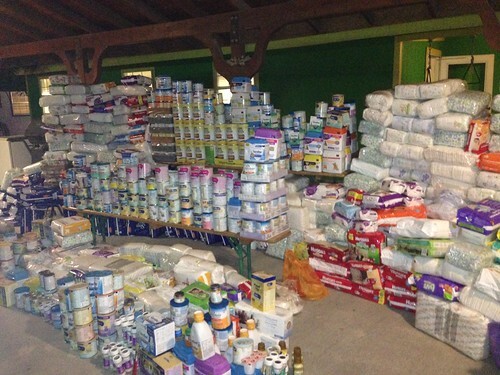 Our church, Redemption Gateway, was sending its first team and held a diaper and formula drive the Sunday before we left. Our church family literally gave as though their own lives depended on it. It was inspiring. 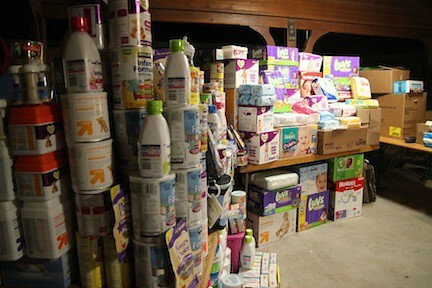 • When someone holds a diaper/formula drive for the Babies, we typically just get to see the fun outcome of the drive as a whole and not the individual donations. But with the Redemption Gateway drive, we got to see the whole and also a few bonuses. I think this is where the beauty of this ministry comes in and reminds me why we stack supplies and take pictures. My husband’s favorite drop off this go-round was a Kirkland brand can of formula in a Taco Bell bag left on our friend’s front porch. This giver missed the drive at church on Sunday, but was compelled to go out of their way to get a can of formula in our hands to take down. My stand-out favorite was a final hour drop off right before we loaded the trailer with supplies. 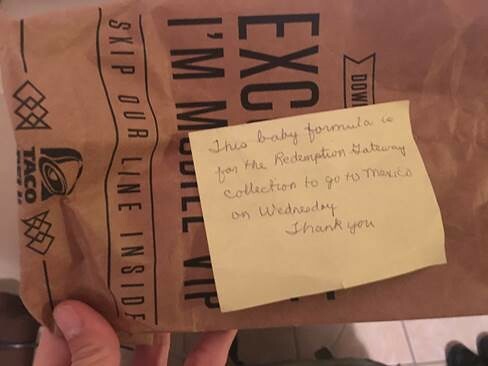 A woman from a small group at our church went out of her way to get our address and came the night before we left to drop off a pack of diapers. God knows the baby whose empty stomach didn’t stay empty because of that Kirkland formula. And he knows the baby who gets clean diapers instead of sitting in dirty ones with a sore-infected bottom because of that last minute drop-off. He sees your giving and your efforts, and he is pleased. • How is a person supposed to be brief with all this great stuff going on?! Don’t even get me started about all I’m leaving out! • So when I look at the Thanksgiving abundance and then the bounty of load 55, I might be tempted to wonder how on earth load 56 will come together. Where will the next round of supplies come from? How will we ever keep this up? I’m so happy to report that nine years in, there’s finally no wondering (or worrying) from me. God himself is putting it together. I’ve already gotten a sneak peek too, and let me tell you—he is doing a magnificent job. Have you ever felt stuck? I’m feeling stuck. 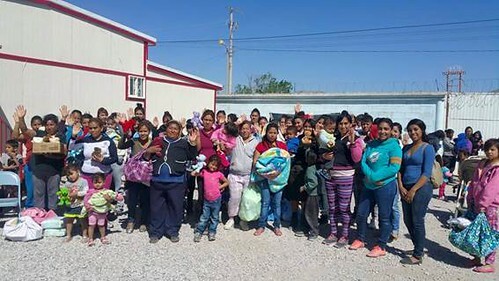 Eight years ago, when we started collecting diapers and formula for the babies of Juarez, I had no clue what the future held—that we’d still be collecting supplies and taking them to Mexico. Mostly it was a day-at-a-time, donation-by-donation thing. 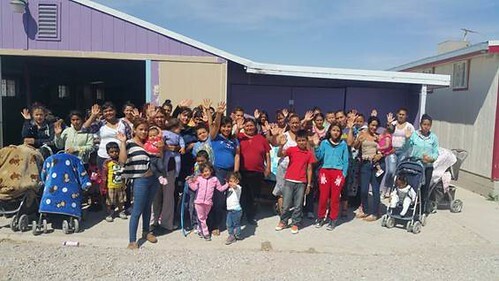 Yet the passion I have for these families and their need has done nothing but increase over the years, which reminds me the fire is God-given! So here I am—stuck and at a loss to fully convey what’s in my heart. If you’ve been down to the colonias you have seen the situation with your own eyes. It’s ridiculously hard for people to find work there. When they do, the average wage is $8-10/day. How do you provide food, clothing, shelter, water, and education for your family on $10/day? Diapers and formula are expensive to those of us with a much larger wage. Can you imagine buying them with a $10/day paycheck? I want to share pictures of the last two supply loads taken down to Mexico. But first—a story. We hauled Load 52 down a few weeks ago, and while there, my friend Jacque and I had an unexpected opportunity to meet a young family who was receiving formula from you for the very first time. We were headed back to Leo’s office (Leo is the head national for Missions Ministries) on an unrelated errand and we found him meeting with this sweet couple and their four-month-old child. They had just come from the doctor, receiving news that their baby is dangerously underweight. 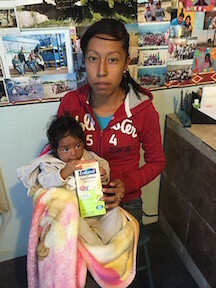 Moms in Mexico try to breastfeed, but due to diets of primarily beans, rice, and tortillas made with lard, they usually don’t have the nutrition to do so. This young family had nowhere to turn and no means to buy pricey formula. Jacque and I could see the deep concern on their faces. Someone told them about the help offered through Babies of Juarez, and they went straight to the team center. We also saw a sense of wonder in them, like “is this really happening? Is it too good to be true?” Yet what could be more like God than seeing their need that day and showing up to meet it? When that formula was purchased on the clearance rack at Fry’s, God knew full well where it was going. May I never ever get tired of watching him provide. May the wonder of it never be lost on me. I’m telling you about this family because we need your help. 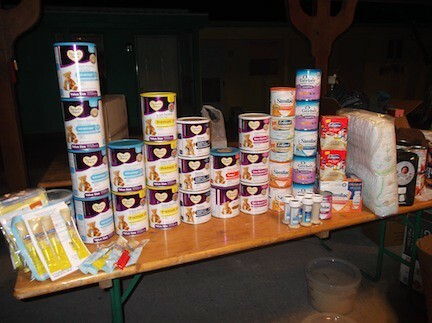 The number of babies being fed and diapered through this ministry continues to grow. An incredible gift and privilege! People come from many miles to get help for their families. Meeting this young family and sensing their anxiety over the need staring at them broke my heart and spurs me on. It’s that time of year when the many needs of this world are (rightly) put before us at every turn. The holiday season and end-of-year push. We struggle to find balance between all we have materially compared to the rest of the world, and yet because of our culture we sometimes feel squeezed financially too. It’s an interesting rub, and something I hope we all grapple with as we enter this Thanksgiving and Christmas season. Our family heads back to Mexico on November 25, pulling a trailer we hope will be full of supplies for these in-need babies. I don’t really like to ask for help, yet on behalf of the babies, I’m asking today if you’ll help us fill up that trailer. For my home address, please e-mail quincyjoyanderson/at/gmail.com. amazon.com will deliver diapers and formula right to my front door. Super simple, right? Maybe you’ll feel such a gift tighten your budget, maybe you won’t. We’re all in different places financially. But I can promise—your gift will be felt in Mexico and quite possibly be the difference between life and death for a child. And now—the lovely pictures of loads 51 (collected in Denver) and 52 (collected in Phoenix.) God’s jaw-dropping provision through you. 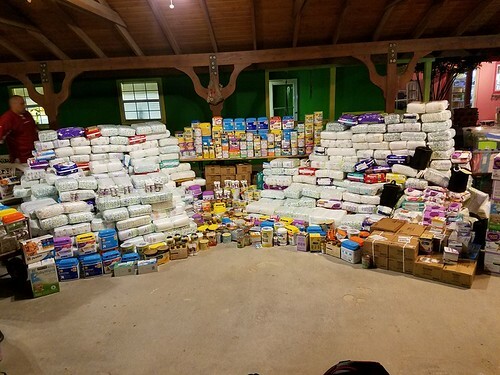 I have officially abandoned my search for words that might adequately describe this massive load of diapers and formula. I didn’t have any the day we delivered it and stacked it, and I don’t have any today. The pictures don’t quite do it justice either, but please trust me when I tell you it was overwhelming. As always, there were many contributors. Too many to name, and all playing an important part. I do have to call out Redemption Gateway, our children’s pastor Mark Andress, and his generous VBSers though. 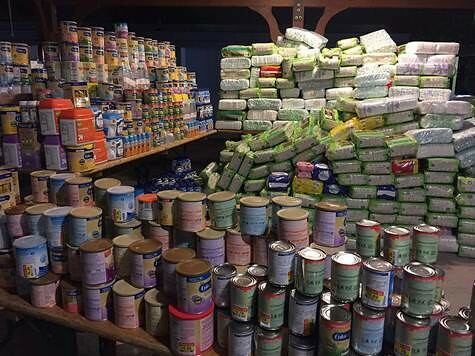 They took what would have been a marvelous amount of supplies and made it an extraordinary, mind-blowing amount of supplies. Thank you for your incredible support, Pastor Mark. 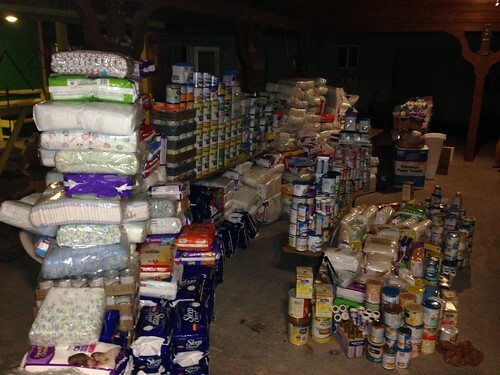 Many babies were fed and given clean diapers thanks to your crew’s over-the-top giving. The body of Christ in action. 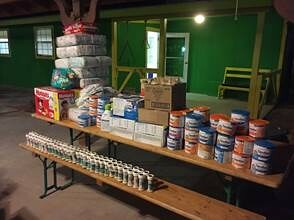 We had the honor of taking two more loads of supplies recently. In both January and March, supplies were taken down from Colorado and Arizona. Thank you for your faithfulness in continuing to support this cause. 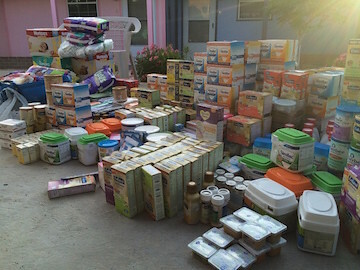 You have made a difference in the lives of many hungry babies and underprivileged families. Circumstances caused the January load to go across the border in multiple shipments, so I have only this fraction of supplies from a good-sized load to show you. 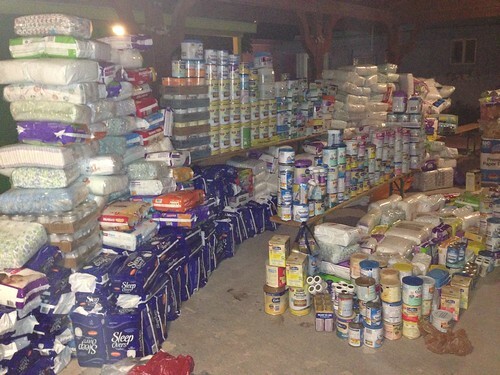 The shelves were empty when this little bit arrived, so we were grateful more supplies were coming across soon! And one picture I can’t resist including, because this is all about the babies. Here’s an alert and content little love my husband, Dusty, got to hold during a church service in Mexico. The mom handed him a bottle of BOJ-supplied formula in case she got hungry. Does life get any better than that? I think not. And also…New to You Consignment sale has kindly agreed once again to support the Babies of Juarez cause and distribute our flyers during their sale. If you’re in the area, please go out and support them in return! A flyer with details is attached. I’m keeping this short and sweet. Just had to share pictures and express my gratitude for the many ways you continue to give.